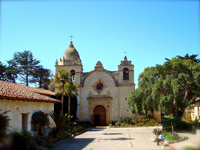 I found myself completely free on a lazy, mostly sunny Saturday and ready for a short drive, so I breezed through Carmel, took in the beach watching dog walkers and surfers then watched the rising sun reflect of the old walls of the Carmel Mission. 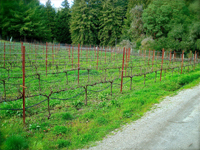 On a whim and with an old friend in tow I headed north to re-visit my happy wine hunting grounds in the south Santa Cruz Mountains and see the vineyards getting their finishing (pruning) touches before the new season on the vine and the bud break. After a couple of weeks of rain the sun etched a smile on my face and turned my cheeks pink as we twisted and turned our way towards the little hamlet of Corralitos, that used to be more famous for country old world sausage that classic Burgundian style Chardonnays and Pinot Noir, plus now emerging as a new hot spot for Syrah. 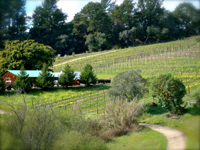 The landscape is full of scrub oak, orchards and redwood groves set in rolling hills with a peak at the ocean. It was magic to see the glistening Pacific in the distance, with lush green hills all around and with the sloping vineyards making it just that much more special. I really like this place, and I admire the wine made here a lot. 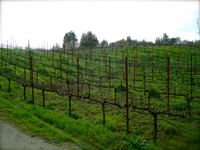 Things have changed around here with world class wines being turned out here, going from orchards and small farms, which remain unfettered still, with the addition of quality wine estates and the wine geeks, like me buzzing through the hills and redwoods to find them. I have waxed about Alfaro Family Vineyards and Windy Oaks Estate so much my old friend was getting antsy to be there all ready and taste their wines, or it could have been my driving, but either way, she was blown away with the quality and beauty of the place, and she had been living in Italy, so it made it all that much more impressive. I have been saying for a few years now that this was the next big find and that the wines here were going to be a big deal, like the Santa Lucia Highlands and the guys like Pisoni and Franscioni. 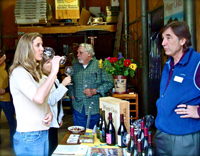 I feel that Richard Alfaro, Alfaro Family Vineyards and Jim Schultze, Windy Oaks Estate will get that kind of reputation and lead a rush to the area. Now, I’m not alone, with critics and wine big shots finding their way here to see what is happening, plus both Alfaro and Schultze have been collecting gold and silver medals like I collect grey hair, especially the San Francisco Chronicle which has some of the best wines in California gathered for blind judging. Well it couldn’t happen to better or more passionate people and talented wine-makers, as they continue to turn out unique and terroir driven wines that rival the best from anywhere. 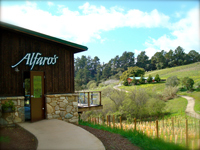 Stopping at Alfaro Family Vineyards is a great way to stretch the legs after the drive and feel the laid back nature of the place, being so close to Santa Cruz it could be no other way. The casual earthy feel and the warm smiles are welcome and refreshing, giving little hint of the seriousness of the wines being served. Richard who is always ready to give complete vineyard tours, either in the truck or the ATV, gives a running dialog of almost each row of vines and has an endless supply of stories that remind me of “ A Year in Provence”, in a Santa Cruz tweaked version of course, all witch shows his passion and provides humor to the quiet and pretty landscape going by. His wines offer some of the best value in premium wine there is, with some stylish and complex wines starting under $20. Then there is his select estate vineyard wines, these are amazingly layered efforts that will stun any wine enthusiast, especially his Lindsay-Page Chardonnay, which for me is one of the best Chards in California, regardless of price and I would say it can hold its own to most Chassagne-Montrachet and even some Puligny-Montrachet, such is the class and depth I find in it. They were pouring the 2007 version, and it is just getting better and better. Note I have rated this wine 95 Points for the 2006 and at first rated the 2007 about 93-94 Points, but I am thinking given a bit of age, I may have to change that and rate it higher, as it is now on par with the 2006 easily! Richard’s Pinots are all lovely and ripe, all garnering low to mid nineties scores and I was impressed with his entry level “A” Pinot this time, this was the new 2007 release and it showed elegant bright fruit, good depth and should get even better once the wine settles into place. The 2006 Lindsay-Page Pinot shows very ripe sweet plumy fruit and has a long creamy finish with smoky vanilla oak shadings. This was a great way to start the afternoon. Then we tried the Syrah, wow, this may end up Richard’s star wine, regardless it is a big success to me with classic Rhone character. The cool climate gives a dark purple color and a perfume of violets, game and intense black fruits with a cayenne note. The palate is full of red and black fruits, currants, cherry liqueur, white pepper and savory game and sweet herbs, finishing with smoke, chocolate powder and vanilla toasty goodness. As a heads up look for his 2006 Ryan-Spenser Syrah coming out soon, this promises to be an intense monster Syrah with great depth and stunning power, I tried it in barrel at was blown away, I will bottle review it soon, so stay tuned! The Pinot Noir grape captured Jim and Judy Schultze heart and they remain spellbound to Burgundy, the spiritual home of this magical grape and still the ultimate goal post for Pinot nuts. Remarkably they found a spot, planted a vineyard, worked hard in the traditional Burgundian ways and came up with a wine that shocked me, and the world, with real burgundy class and elegance with flavors that screamed Chambolle-Musigny. I was working with Jacques Melac, a French wine expert, at the time and we tried Jim’s first Pinot, the 1999 Vintage and bought it on the spot! Jacques and I had recently finished a marathon Burgundy tasting so we really were stunned by Jim’s effort and I’ve been a fan ever since. Nothing in the following years has changed my mind about Windy Oaks; this is classic and delicate Burgundy like wine with some interesting unique characters that are developing over time with vine age. 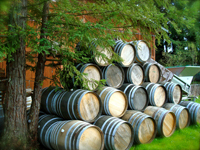 Jim employs old world winemaking and lets the wine be as natural as possible without filtration or fining, which adds to depth and complexity of his wines. Even though his wines don’t tend to be dark, they are deep, rich and long finished. He says long fermentations bleed pigment, but add flavor and perfume, so don’t fret about the lack of color, and let the wine make its impression on the palate. Jim is going to with the 2007 vintage have about 10 different bottlings of estate Pinot Noir all from separate blocks and he has a wild yeast Pinot and a whole cluster pressed Pinot as well, plus the Estate Cuvee from mixed blocks. We tasted four Pinots, all different and all wonderful in flavor and texture with depth and interesting character. Somewhere in my mind I recalled visions of the Willamette Valley, Oregon and memories of wines from the Cote de Nuits, Burgundy when tasting Jim’s wine, though they all had their own distinct profiles. 2006 Windy Oaks Estate Pinot Noir “Henry’s Block” Schultze Family Vineyards, Santa Cruz Mountains. 2007 Windy Oaks Estate Pinot Noir “Estate Cuvee” Santa Cruz Mountains. 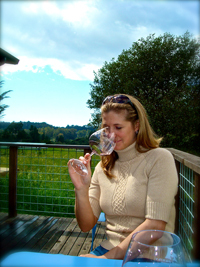 2006 Windy Oaks Estate Pinot Noir “Diane’s Block” Schultze Family Vineyards, Santa Cruz Mountains. 2007 Alfaro Family Vineyards Pinot Noir “A” Estate, Santa Cruz Mountains. *Will get better in the next 4-6 months, no question.